Conditions for the R Stone Chalice on Sunday 28 September were wonderfully warm and sunny with a light and often shifty easterly wind, making for challenging racing and plenty of place changes. Eight teams came to the line at Bateman’s Tower where our trusty team of Pam and Nick Readings and Marilyn Hempstead got racing underway from the RIB. With a strong flood tide running and a first mark of Hills, the choice had to be made between starting near the committee boat and fetching straight to the Mersea shore or starting near Bateman’s and holding up on the Brightlingsea shore before crossing the tide. It was a close call, but Jeremy Newman’s C32 Avocet took the Mersea side to establish an early lead by the first mark. As the boats came hard onto the wind for a beat across to Beach Avocet began to eek out her lead, whilst Danny Fox and the boys in C8 Egret established themselves in second place. Behind them the rest of the fleet jostled for positions. Mark White in C53 White Spirit and Phil Rust in C16 Dulcet didn’t get a great starts and then struggled a bit on the first leg, but both found some form as they came onto the wind and began to pass boats. Alan Hick’s C54 Storm Petrel and Fi Brown’s C51 Grethe initially looked pretty good, but were amongst the boats who struggled to get into phase with the tricky conditions. 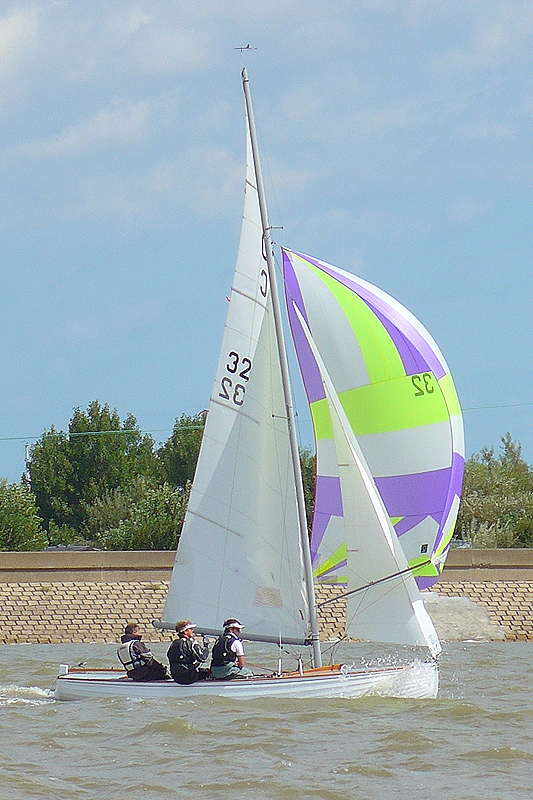 Mike Hempstead sailing C18 Gelasma had stuck with the Brightlingsea shore off the start and it paid off nicely for him. But his first beat saw him drop back down the fleet, before recovering a little on the second. As the leaders stretched away, the rest of the pack continued to vie for positions. By the start of the second lap Avocet’s lead looked unassailable, but Egret sailed a superb second short lap making up a lot of ground. Egret must have been hoping for a third lap to give them time to pass Avocet, but it was not to be and on the line Avocet took victory a minute and sixteen seconds from Egret. Behind them White Spirit had been working super hard and pulled up into third place to lead Dulcet and then Storm Petrel across the line. Gelasma and Grethe had a lovely fight for sixth place with Gelasma just managing to hold off the girls on the line and Trevor Stone and C20 Ruff team following them in to completed the rankings. Post racing the entire fleet retired to the CYC Balcony for a well deserved refreshment and to look back on a wonderful afternoon of BOD racing. With the Final Fling coming up next Sunday 5 October (start from Bateman’s at 10.30) and the forecast looking promising for a lovely final fleet sail of the season we hope to see as many BODs as possible on the water and joining us for a carvery lunch at CYC at 13.30. Don’t forget to book in for the lunch at the CYC by calling 01206 302594 by Wednesday 1 October latest – tickets £14.50 each for main course, pudding and tea/coffee – all BOD friends and family welcome.